Therefore, I can’t in all honesty say I only practice Functional Medicine, Functional Medicine, Orthomolecular Medicine, Ayurvedic Medicine, Traditional Chinese Medicine, etc. After 18+ years of study, thousands of books researched, and having practiced in clinics all over the world, I can assure you that each form of medicine has real merit to it… And that is why ALL forms must be used. If we remove our egos and always ask, “what is best for this particular person at this time,” then I believe we’ll come up with the proper answer (given the practitioner has an open mind and wide education). 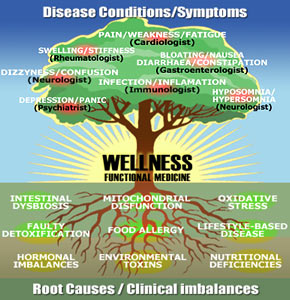 This may not be the concrete answer you’re looking for in terms of how I practice, so I would like to direct you towards a piece that Dr. Hyman wrote up on Functional Medicine and how it closely approximates how I care for my wellness clients and help them get well again.